South Moravia is a region of the Czech Republic that borders with Slovakia and Austria. I have visited on two occasions, in July 2013 and then the following April. The region gets its name from the Morava, one of Europe’s lesser known rivers, a tributary of the Danube. Over time it has been straightened for industry, though some of its natural meanders do still exist, I find its influence on the surrounding landscape to be fascinating both historically and ecologically. The impact of communism on the landscapes of Central and Eastern Europe are clear. Small fields were opened up and collected, taken under state control. The rivers were canalised and wetlands drained for agriculture. The similarities to post-war capitalism are strong: it was the case of two warring ideologies attempting to increase and establish their populations with similar technologies and agricultural industries. The advances in agriculture, sanitation and medicine meant that, despite hundreds of millions of deaths in the Second and First World Wars, the population of the earth tripled in the 20th century. The irrevocable ‘taming’ of continental and Eastern Europe’s natural landscapes, and loss of traditional management techniques which in fact sustained many of the richest habitats, was thought to be largely complete by the 1980s. That generalised view, however, does not give the full picture. Nature is adaptable and human perspectives change, as South Moravia’s landscapes show. The Google Earth view of the Morava’s natural meanders at Bzenec. A now vegetated oxbow lake can be seen in the ‘o’ shape next to the ‘S’ shape in the mid left-centre. The impact of post-war industry was felt across Europe’s waterways, though the damming of the Danube was to be undertaken most severely only by the 1990s. Many rivers lost their natural meanders, straightened to aid the passage of goods and people. The Morava is an excellent example of this change. The only remaining natural meanders of the Morava can be found on the edges of Bzenecka Doubrava, a pine plantation established on the river’s sandy edgelands. The sandy conditions were created by the Morava, the river having deposited sand throughout the landscape over thousands of years. When I visited in July 2013 the trees at the edges of the river were collapsing into the water as the sand slowly eroded the banks. This way new meanders could be formed if given the chance, the silting up of the edges thinning the watercourse and increasing the erosion on the opposite side through the increase in the pace of the water’s flow. It’s unlikely that the river will be given free reign, however, as the neighbouring plantation is of economic importance. Perhaps the river’s power will be too great in this case. The river’s work has also given people the chance to exploit these vast deposits of sand. Very close to the river was a working mine. But nature has not lost out completely here, the sand was being mined by sand martins (Riparia riparia) which in turn were being hunted by hobbies (Falco subbuteo) and their nests excavated from above by foxes (Vulpes vulpes). The mined areas as seen in the image above were being replanted with broadleaved tree species. I photographed the sand mine from Váté písky, a protected area known as ‘the Moravian Sahara’. Green lizards (Lacerta viridis), with their beautiful blue mouths and green-yellow bodies snuck out from pieces of deadwood to eat ants and have their picture taken. My friend Karel Šimeček knows this landscape inside out. You would be forgiven for thinking the wildlife knew him just as well. He found a pine hawkmoth in the grasslands of Váté písky. Karel has campaigned for many years to protect this post-industrial landscape – the likes of which would be built on without much thought in the UK nowadays – and he has successfully achieved designations to protect habitats in Bzenecka Doubrava for nightjar (Caprimulgus Europaeus). This nocturnal, African migrant is threatened by the proposal for a new motorway through the area. As the Morava is a tributary of the Danube, it also has tributaries of its own. One of the larger towns outside Brno in South Moravia is Kyjov, home to the Kyjovka. Above is an image of the Kyjovka valley, the landscape redrawn by the flow of water and ice over thousands of years. On the edge of the fishponds is an area of woodland where black stork (Ciconia nigra) could be seen perched, overlooking the ponds. They are massive birds and, like their cousins the white stork (Ciconia ciconia), migrate to Europe in spring from Africa. A song thrush, my favourite bird. We get into Karel’s silver Peugeot estate with Radiohead’s Kid A on the stereo, a welcome reminder of home, and we set off. The roads are mostly empty but then it is 8:30am on a Sunday morning. I ask Karel about his interest in wildlife. ‘Different reasons. Agriculture is very important but it is probably the main reason,’ he says. I was astonished to see how large the fields were in South Moravia. My host is conservationist Zuzana Veverkova, and she told me that the average field size is 500 hectares, meaning that small-scale, sustainable farming is impossible. Young people cannot find a way in other than through inheritance. And there are reasons why farms are so large: inspired by Stalin’s collectivisation of Russia’s agriculture, the Czech communists did the same, forcing farmers off their land and into prison if they refused. Today you have the corporate farming practice with monocultures of what Karel calls ‘the yellow evils’ of wheat, corn, sunflower and rapeseed. In some places, there are miles of these plants and nothing else. ‘Do you know the hunters?’ I ask. We pass out through the fields, a pine wood on the horizon. ‘A few friends and I managed to get the pine forest protected as a nature reserve,’ says Karel. That was not enough to save its most unique resident. 20 years ago it was home to more than twenty singing male ortolan buntings. Today there are none. Karel laments this fact as we take a swerve in the road, our passage halted by a pair of white storks treading through a field. Karel reverses and I photograph these graceful birds. They watch us, too, turning away and moving further into the pasture. Arriving at Mutěnice fish ponds we stand on the rickety wooden footbridge where the River Kyjovka dams, the water splitting off into the ponds. Leaves cover the surface, a red admiral arriving to bask on the enforced stillness. Karel points to a stand of dead poplar trees on the other side of the river. ‘That’s the beaver’s work,’ he says. They’ve been here for thirty years. About five years ago the manager of the ponds attempted to eradicate them, but he failed and so the beavers remain. They arrived here from Austria from the Morava, the river that gives this district its name, running the border with Austria and reaching the Danube in Slovakia. When they first appeared here one beaver was captured and interred in the local zoo. It escaped within 24 hours and returned to the fish ponds. Turning to step off the footbridge, over a few missing slats, Karel glimpses a kingfisher as it lands on a rock in the Kyjovka. I lift the camera to it but can’t switch it on in time to get the shot. Off it goes, electric blue bolt into the willowy shadows of the river. And as we trample through the long grass alongside the river Karel picks out the calls of young kingfishers and a perch that bears the signs of the birds, no leaves, just bare and worn. Through the binoculars I see a huge animal beating its great wings, with primary feathers so long they look like fingers that could dictate some deep, magical changes to the world below. But no animal is safe or indeed at peace for long on Earth. 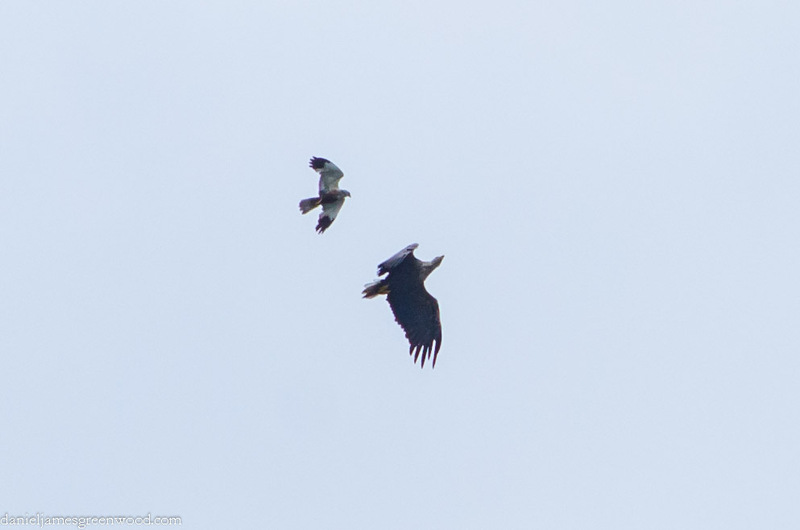 Karel has seen alongside the eagle a marsh harrier attacking it, and moments later another appears. I set my camera and start clicking. The eagle looks overdressed in its Gogolian greatcoat of brown feathers, its white head and neck protruding out from under, yellow talons dangling out below like down-turned coat hangers. The marsh harrier strikes again and again, forcing the eagle away from the sky above the huge pond and towards the trees, until the battle is over and all three have left my field of vision. ‘The migration patterns of cormorants are well known,’ he says.